The three-time World champion adds the Paralympic crown to his collection. EOGHAN CLIFFORD CONTINUED his dominance of the C3 Time Trial this afternoon as he powered his way to a sensational victory in Rio. 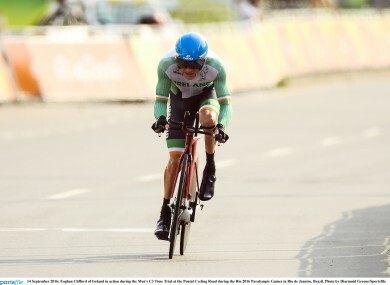 The Limerick native, who is a three-time World champion in this event, adds Paralympic gold to the bronze he won in the Individual Pursuit on the track last Friday. Clifford finished in a time of 38:21.79 around the 30km course to beat Masaki Fujita of Japan and Canada’s Michael Sametz. His margin of victory was a whopping one minute and eight seconds. The 35-year-old joins Jason Smyth, Michael McKillop and the tandem pair of Katie-George Dunlevy and Eve McCrystal in winning gold at these Games and brings Ireland’s overall medal tally to six. The lecturer had been struggling with a debilitating knee injury, due to a degenerative muscle disease, but he showed no signs of pain as he obliterated the rest of the field with a performance which emphatically underlines his supremacy at this level. “Physically it was painful,” he admitted. “Power wise it wasn’t one of my best ever rides. I was really disciplined during the ride. Even a problem with his chain midway through the race couldn’t derail his bid for gold, as he justified his status as pre-race favourite. He will go into Friday’s road race with the same mantle, and few would bet against him winning a third medal of this glorious Games. Email “Gold! Sensational Eoghan Clifford battles knee injury to win second Paralympic medal”. Feedback on “Gold! Sensational Eoghan Clifford battles knee injury to win second Paralympic medal”.